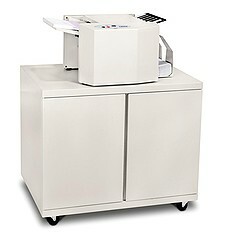 The Formax FD-1500 AutoSeal is a low volume folder/sealer solution for processing one-piece pressure sensitive mailers. The FD-1500 was built with proven Formax technology and provides an economical solution with the quality and reliability you have come to expect from Formax. The sleek office design and ease of operation makes this unit ideal for processing documents in an office environment with low volume applications. With a processing speed of up to 85 forms per minute it enables operators to complete daily jobs with ease. The added capability of processing 14” forms gives the FD-1500 the versatility needed to fold and seal virtually any low volume application to meet your needs. The FD-1500 handles a variety of even panel forms up to 8 1/2” x 14” including checks, invoices, school reports, tax forms and appointment notices. Pressure seal mailers can be used for virtually any application that can be printed on one form. The extended fold plate processes uneven panel forms up to 8 1/2” x 14”. The FD-1500 features a heavy-duty steel construction and offers the dependability and power expected of a larger unit in a smaller package. With a processing speed of up to 85 forms per minute this machine enables an operator to complete daily jobs in no time. The FD-1500 is designed for user friendly operation. All the user has to do is simply set the folds according to the clearly marked settings on the fold plates, load your forms using the drop-in feed system, press start and wait for it to be done. The FD-1500 has LED indicators for power on, fault detection, paper out and cover open, and it also includes a six-digit counter for audit control. The FD-1500 Auto Seal features a Drop-In Feed System which produces dependable feeding of forms with no paper fanning required and has the ability to fold in five different forms including: Z, uneven Z, C, half folds and custom forms. If you have any questions or are interested in purchasing the Formax FD-1500 AutoSeal, visit us at SpiralBinding.com. We have great pricing on a full line of Pressure Sealers. Call us at 1-800-631-3572 for more information!